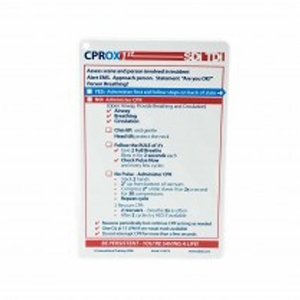 THE CPROX 1ST AED STUDENT SLATE OFFERS THE USER A QUICK, AT-HAND, CHECKLIST OF THE STEPS INVOLVED IN ASSESSING AN EMERGENCY SCENE AND THE PROPER PROCEDURE TO FOLLOW BASED ON THE SITUATION. Included on this slate is the CPR process, basic first aid, as well as the general practice for administering emergency 02. This item is plastic, and completely water-proof.